It has been another bad week for Hillary Clinton. On Tuesday the State Department contradicted Hillary Clinton’s claims about the Justice Department investigation, stating it was prompted by Clinton’s exclusive use of a private email system. The week ended with two separate reports of business related email being among the email which Clinton deleted, claiming it to be personal. The Obama administration has discovered a chain of emails that Hillary Rodham Clinton failed to turn over when she provided what she said was the full record of work-related correspondence as secretary of state, officials told The Associated Press Friday, adding to the growing questions related to the Democratic presidential front-runner’s unusual usage of a private email account and server while in government. Obama administration officials made new revelations about Hillary Clinton’s emails on Friday, as the ongoing controversy continues to spin against the Democratic presidential front-runner. In one announcement, a senior State Department official said that the department was handing over “a small number” of new emails related to the 2012 attack in Benghazi, Libya, to a House committee investigating the incident. Separately, the Associated Press reported that the administration had discovered a new chain of emails that Clinton had declined to turn over, despite her claims to have provided the government with all work-related messages. The news builds on the growing scrutiny on Clinton, which has threatened to derail her White House campaign. The emails have been implicated in nearly three-dozen ongoing public-records lawsuits against the State Department, and the ongoing fallout threatens to stretch at least into 2016. The Petraeus emails, however, represent a more serious breach of protocol. The State Department’s record of Clinton emails begins on 18 March 2009 – almost two months after she entered office. Before then, Clinton has claimed, she used an old AT&T Blackberry email account, the contents of which she no longer can access. The Petraeus emails, first discovered by the Defense Department and then passed to the State Department’s inspector general, challenge that claim. They start on 10 January 2009, with Clinton using the older email account. But by 28 January – a week after her swearing in – she switched to using the private email address on a homebrew server that she would rely on for the rest of her tenure. There are fewer than 10 emails back and forth in total, officials said, and the chain ends on 1 February. The revelations could not come at a worse time for Clinton, who has been dogged for months by questions about her email practices. Her poll numbers have also been slipping in recent weeks. The latest poll of likely Democratic primary voters in New Hampshire show the former secretary of state 16 points behind the frontrunner, Vermont senator Bernie Sanders. Her favorability rating has dropped six points since last March, and a Fox News national poll this week found 58% of responders believed she had lied about how her emails were handled while secretary of state. I don’t know how much we can trust information from a Fox poll, but other polls have similarly shown a growing distrust of Hillary Clinton. This is not the first example which has been uncovered of email related to Libya and terrorism which was missing from the email turned over by Hillary Clinton. Missing and altered email was uncovered when compared with Sidney Blumenthal’s email conversations with Clinton. It is unfortunate that the investigation of deleted email is centered around Benghazi. There is unlikely anything further to find about Benghazi, with no evidence having been found to support the Republican conspiracy theories. It would be more interesting to see if there is any email regarding parties in cases where Clinton was making a decision happened to make large contributions to the Foundation, or happened to pay extraordinarily high speaking fees to Bill at the time. While Congressional Republicans are currently concentrating on Benghazi, information on other topics might come out in further Congressional investigation or in the multiple Freedom of Information Act suits in progress. Do Democrats really want to nominate a candidate whose ethical misconduct will likely be the subject of headlines well into 2016? The email was also a major topic of discussion on Meet the Press today. Hillary Clinton tried to write this off as “another conspiracy theory” against her. If so, the “conspiracy” includes the Obama Justice Department, the State Department, most of the mainstream media which is reporting on this, multiple news organizations, such as AP, which have filed Freedom of Information Act law suits regarding the email, and liberal groups concerned with government transparency and ethics which have criticized Clinton for her actions. In reality, this is a scandal which originates directly from Clinton’s own actions. Additional news reports on the email since the original post are at CNN and Reuters. Posted in Bernie Sanders, Hillary Clinton, Scandals. Tags: Benghazi, Bernie Sanders, Hillary Clinton, Libya, Scandals. RSS feed for comments on this post.. TrackBack URL. Why are you assuming that Ms. Clinton wasn't just mistaken about what she handed over, but that she was engaged in active dishonesty? 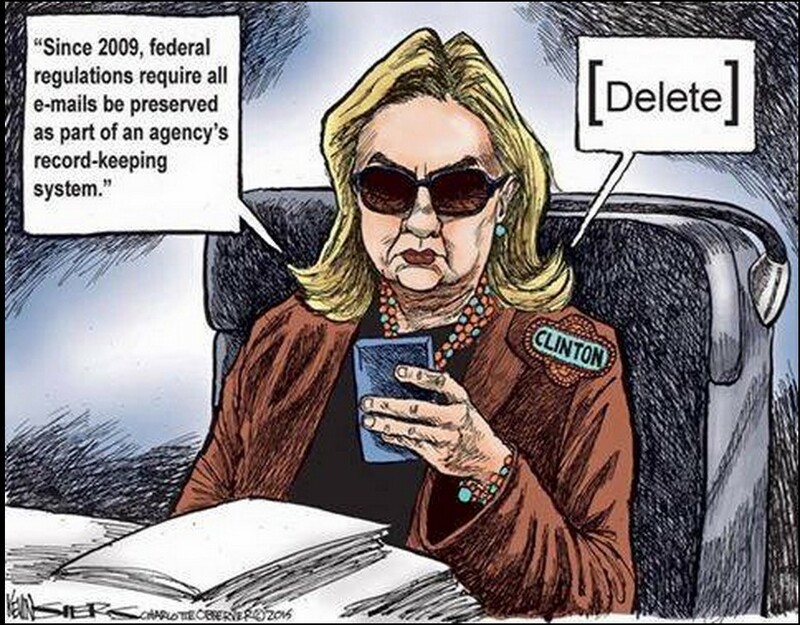 And as any e-mails she didn't turn over would've been preserved in the .gov archives, what would've been the point of not turning them over and lying about them anyway? It doesn’t matter if she was “mistaken.” She violated the rules when she used a private server. She further violated the rules when she failed to turn the email over for archiving while in office. She acted highly unethically, if not illegally, when she deleted the email. She then claimed that only personal email was deleted and we are finding multiple examples of non-personal email having been deleted. As with virtually every statement she has made since the scandal broke, her statement has turned out to be false. The fact is she lied. That's all I need know. I never liked her anyway and decided to not vote for her long ago. As things are emerging, my intuitions are correct. She a cheat and liar!